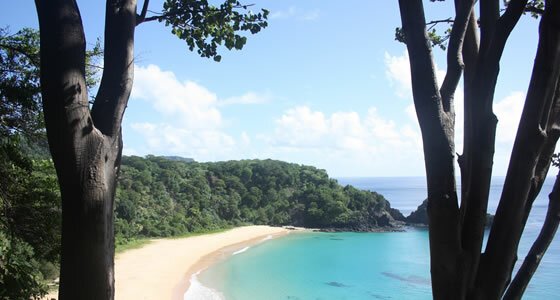 Vacation Package Combinations with Fernando de Noronha Island. Combine your visit to Fernando de Noronha with other cities in the sunny Brazilian cost. Customize your itinerary and vacation package to visit Natal, Fortaleza, Salvador or even marvelous Rio de Janeiro, Iguassu or the Amazon. Fernando do Noronha is a part of the Brazilian state of Pernambuco. There are many exciting cities around the area to enjoy after visiting the islands including Recife, Natal, Fortaleza, Porto de Galinhas and Salvador. All are worth a visit when traveling to Fernando do Noronha. Recife is the capital of Pernambuco with a population of 1.5 million people. It is a primary port in Brazil and is fondly referred to as the “Brazilian Venice” thanks to its many rivers, islands and bridges. Recife is known for its beaches including the best city beach in the world, Boa Viagem Beach. Visit during Carnival or New Years Eve, two of the best parties in the city. There are also plenty of activities to enjoy such as catamaran trips, city tours, scuba diving and beach volleyball and footvolley. Natal is located in the state of Rio Grande do Norte with a total population of 800,000 people. It is considered one of the safest capital cites in Brazil. Via Costeira, the main avenue along the shore has most of the restaurants, hotels and shopping.The city is known for its beautiful beaches, historical buildings and its celebration of Carnival. Fortaleza is located in the northeastern part of Brazil. It is the capital of the state of Ceara. The population is over 2.5 million people. It sits on the coast of the Atlantic Ocean. The beachfront walkway is lined with restored colonial buildings and is quite lovely. The city offers a history train, several important squares with restaurants, shopping, bars and nightclub. There are several museums and local markets. The city is known for its beaches that provide excellent surfing, wind surfing and kite surfing. Porto de Galinhas is located in Ipojuca Brazil. Tourists visit for the famous beaches, reefs and the natural pools. This small town is easy to get around by renting a buggy. There are a lot of wonderful restaurants serving fresh local seafood. Visitors can enjoy a raft trip to the reefs or spend a moonlit night watching baby turtles hatch from their shells. Salvador is the biggest city on the northeastern Brazilian coast. It is the capital of the state of Bahia and is known as the “capital of happiness” thanks to its laid back residents and numerous outdoor celebrations. The city is best known for its music, food and architecture. There are also several museums, markets and parks to visit and of course Salvador is well known for its pristine beaches. There is also a lively night life with plenty of clubs, bars and live music.